Toyohara Kunichika (1835-1900) Minamoto no Yorimasa and Ino Hayata Hunting the Nue, 1870. Oban triptych. This Month's Featured Print. Click here for a further detailed enlargement. Click here for a further detailed enlargement still. A really very fine and dramatic triptych by Kunichika, displaying the kabuki theatre’s fascination, near obsession, with warriors and heroes and with mythology. 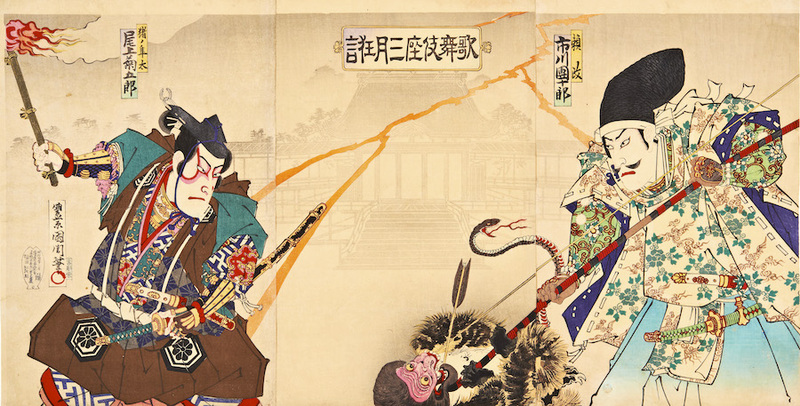 The print, typical of the broad and daring compositions of Kunichika, shows the actors, Ichikawa Danjuro and Onoe Kikugoro as Minamoto no Yorimasa and Ino Hayata. 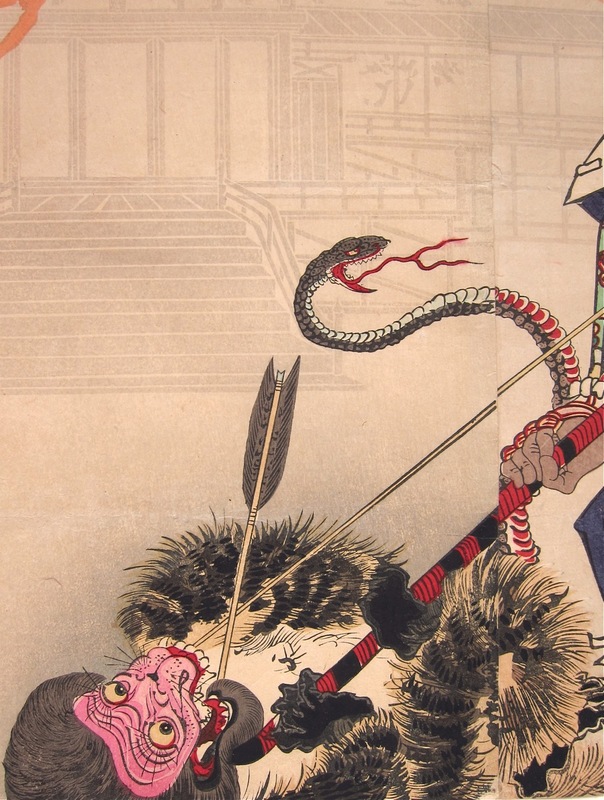 The play, known as the play of the third month, or Yorimasa Nue Monogatari, tells the story of the hunting of a mythical creature called the nue. According to the Heike Monogatari, the emperor fell ill, and neither medicine nor prayers had any effect. The illness was put down to a bird or creature that issued black smoke near the palace precinct. 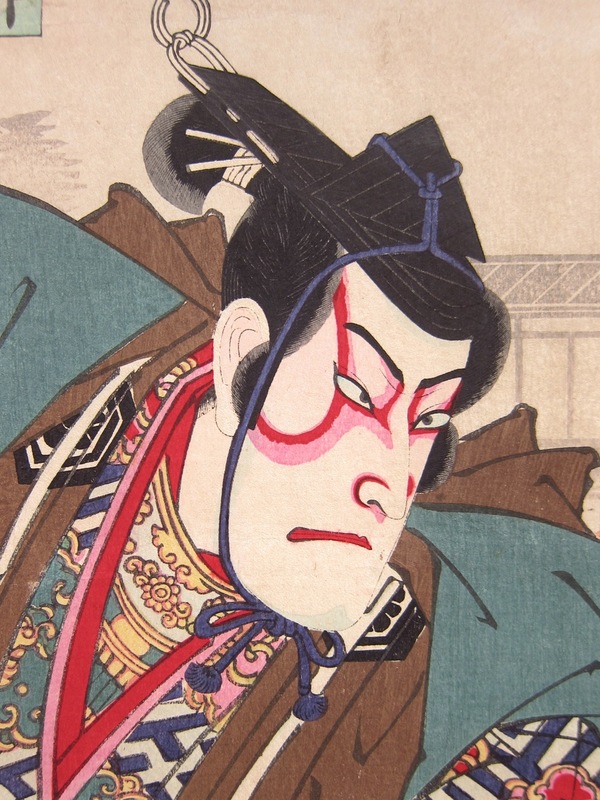 Minamoto no Yorimasa was commanded to investigate and slay the monster. 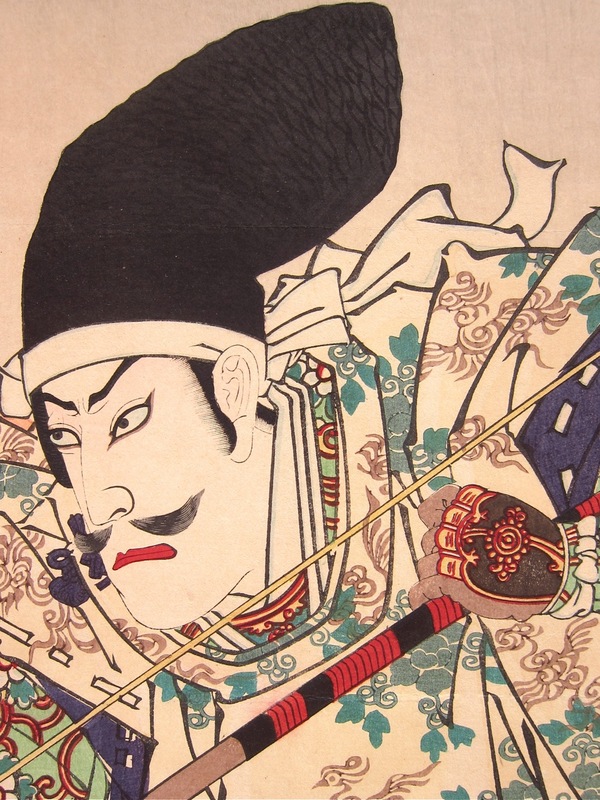 One night, Yorimasa brought along his retainer Ino Hayata and taking along the arrow he received from his ancestor Minamoto no Yorimitsu, he went out confront it. When he shot an arrow made from a mountain bird's tail there was a shriek, and a nue fell from the sky and without a moment's delay Ino Hayata seized it and finished it off. From this moment, the emperor's health instantly recovered and Yorimasa was given the sword, Shishio, as a reward. It is said that the vengeful spirit of the nue tormented the people who lived nearby, or according to the Genpei Seisuiki and the Kandenjihitsu, the nue was said to be buried in Kyoto Prefecture, and it is said that since it was dug out in the Edo period, the area has been cursed. The nue appears in several prints of the period and is described in the Heike Monogatari, as having the face of a monkey, the legs of a tiger , the body of a Japanese raccoon dog and the front half of a snake for a tail. It is a fine print with great colour, and a fine impression. The two figures stand over the expiring nue, its tail a rearing snake threatening to attack Hayata with its last breath. Lightning flashes across the sky and the composition, laid out in front of the imperial palace drawn in shaded monochrome. Full size.